A murder in a quiet English village, long-buried secrets and a man's search for answers about his traumatic past entangle FBI agents Emma Sharpe and Colin Donovan in the latest edge-of-your-seat Sharpe & Donovan novelAs a young boy, Oliver York witnessed the murder of his parents in their London apartment. The killers kidnapped him and held him in an isolated Scottish ruin, but he escaped, thwarting their plans for ransom. After thirty years on the run, one of his tormentors may have surfaced. Emma Sharpe and Colin Donovan are on their Irish honeymoon when a break-in at the home of Emma's grandfather, private art detective Wendell Sharpe, points to Oliver. The Sharpes have a complicated relationship with the likable, reclusive Englishman. Emma and Colin postpone meetings in London with their elite FBI team and head straight to Oliver. But when they arrive at York's country home, a man is dead and Oliver has vanished.As the danger mounts, questions arise about Oliver's account of his boyhood trauma. Do Emma and Colin dare trust him? With the trail leading beyond Oliver's village to Ireland, Scotland and their own turf in the US, the stakes are high, and Emma and Colin must unravel the decades-old tangle of secrets and lies before a killer strikes again. 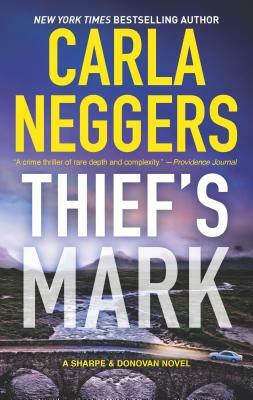 New York Times bestselling author Carla Neggers delivers the gripping, suspense-filled tale readers have been waiting for.